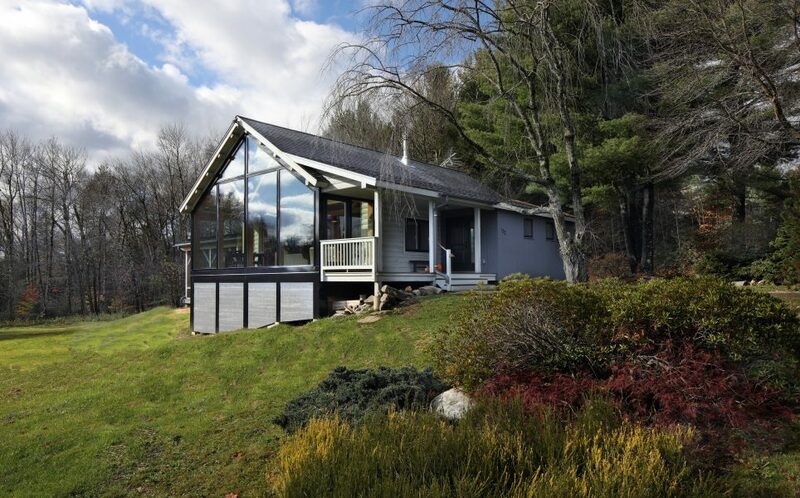 This house was bought in 2016 by a young couple with children, striking out into the wilds of the Berkshires. The original structure, like its log home predecessors, was an inward-looking space. 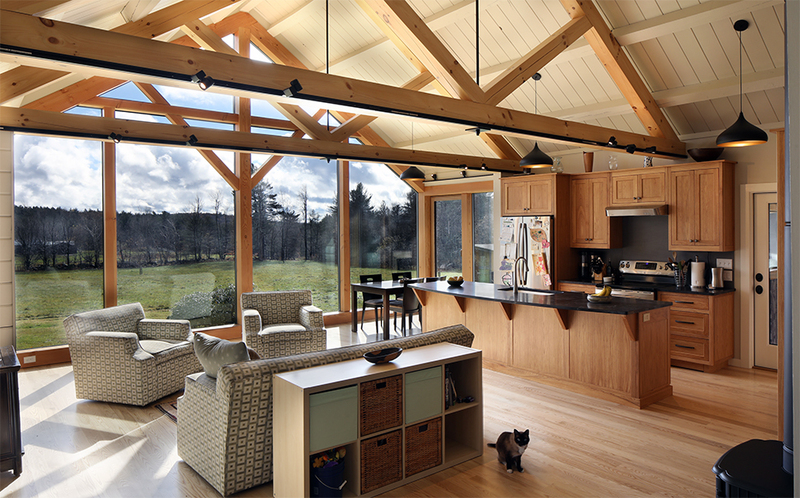 They engaged our firm to reinvent the space and set them on a course to low-energy (net-zero) living — the primary architectural goal being to bring light and view into a dark space, while still maintaining the coziness and character of the log home that attracted them originally. Light (and contrast): Dark walls of stained pine with small punched openings originally produced a sense of sharp contrast and glare. 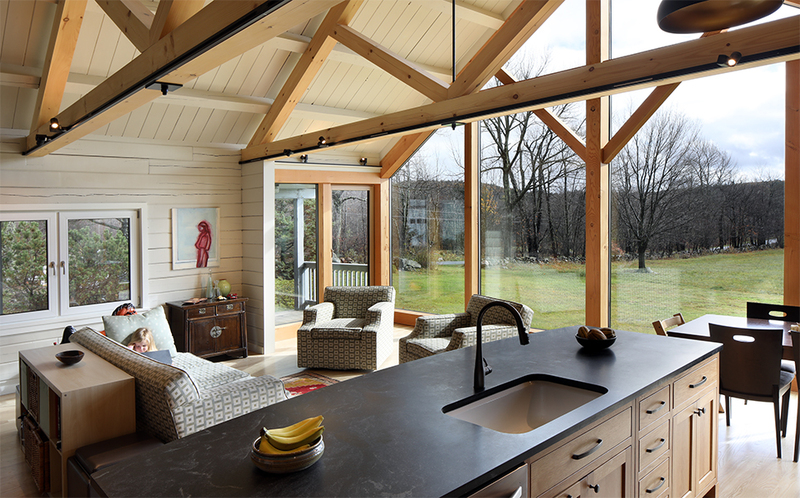 By bringing new glazing to the perimeter of the wall and lightened the color of the surfaces, natural light now carries deep into the space fluidly from outside. 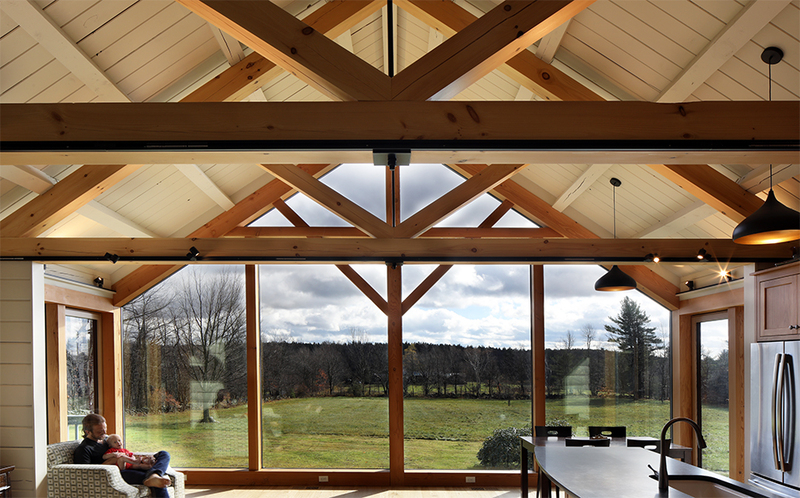 A new LED lighting scheme, including strips of upward- facing fixtures embedded in newly crafted trusses lights both the rooms and the wood that holds the space. A palette of warm whites and greys enhances the reflectivity of the surfaces while maintaining the natural tone and texture. 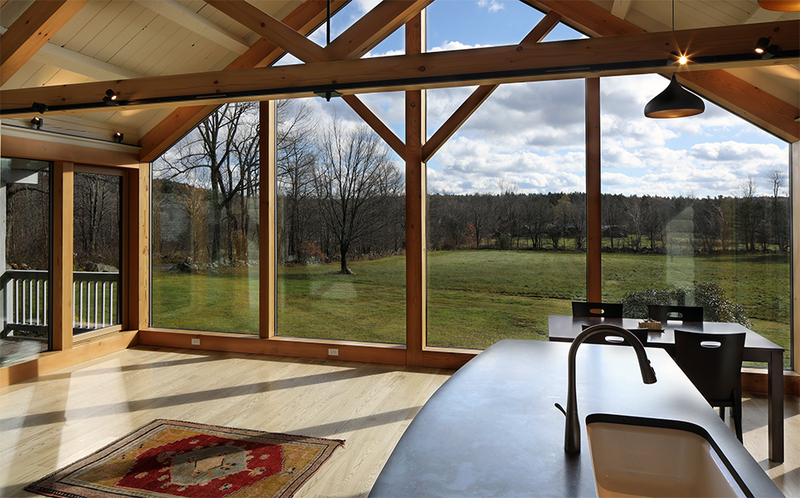 View: The homeowners were drawn to the property by the view that overlooks a 3-acre meadow, bordered by a stone wall where they have spotted coyotes, deer, bears, turkeys, bobcats and a porcupine! The original south wall was covered by a screen porch, which effectively decoupled the heated interior living space from the outside. 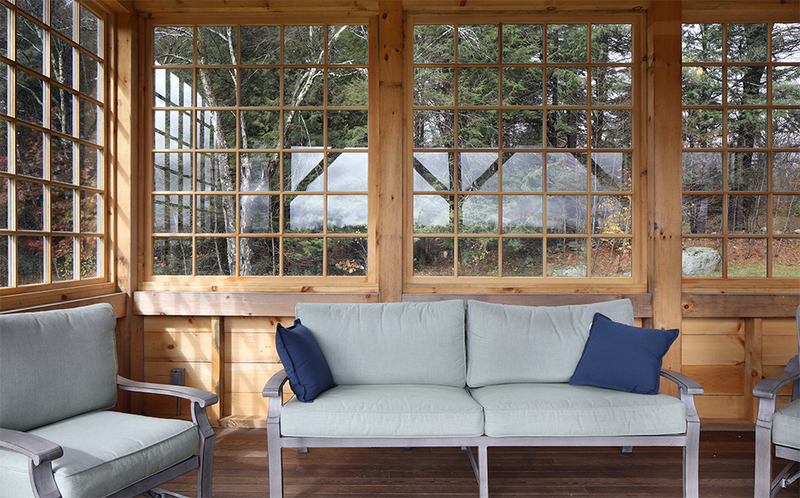 In order to maintain a comfortable space, the screen porch was fitted with a new floor and continuous rigid insulation below the framing. 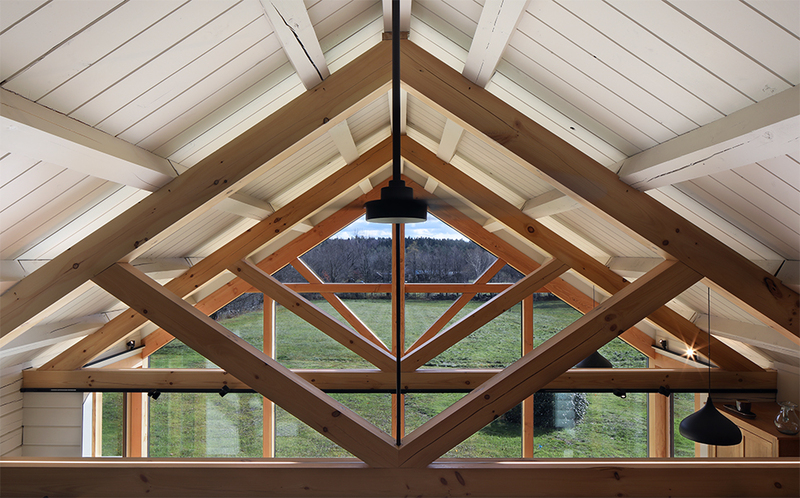 Above the old porch, a loft was removed and the existing roof structure was easily incorporated into the captured space. The second primary project goal was to increase the amount, function, and quality of the usable space without a major addition. 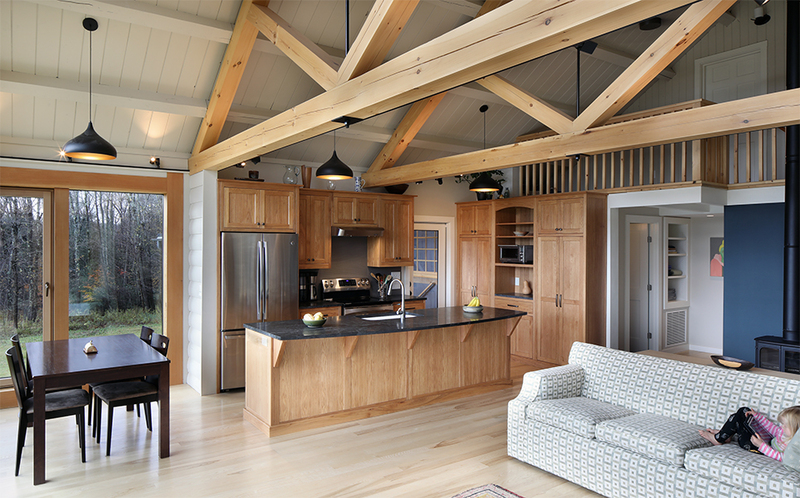 We gained additional square footage by taking floor space and roof enclosure from the little-used east porch, resulting in a generous mudroom where there had been none and conversion of one bedroom into two bedrooms. With the loss of the screen porch to the south, we added a new large screen porch to the west of the main cabin, accessed by a wide stair from the kitchen. This 16’x24’ outdoor ‘living room’ is set close to the ground, allowing an easy access to outdoor spaces and activities. 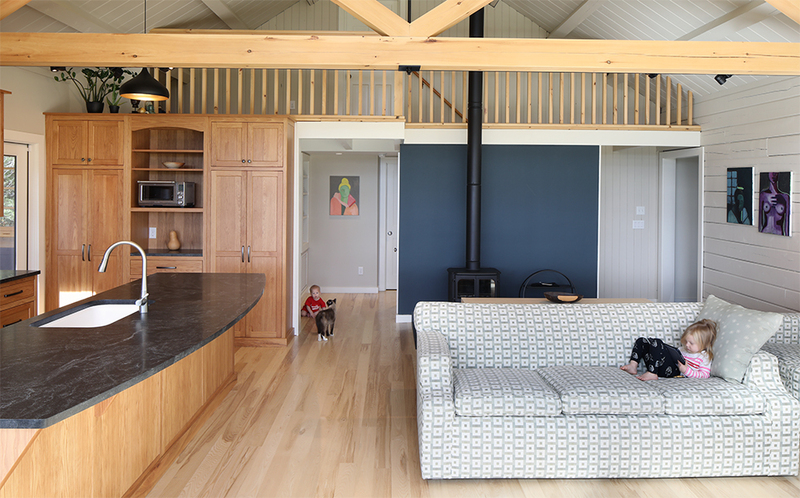 The porch roof hosts a new 8 kW PV solar array, which — with an air-source heat pump and a new efficient woodstove — replace the old drafty fireplace and inefficient oil-boiler. The original stone fireplace was a remarkable thermal bridge, performed poorly, and took up valuable space. 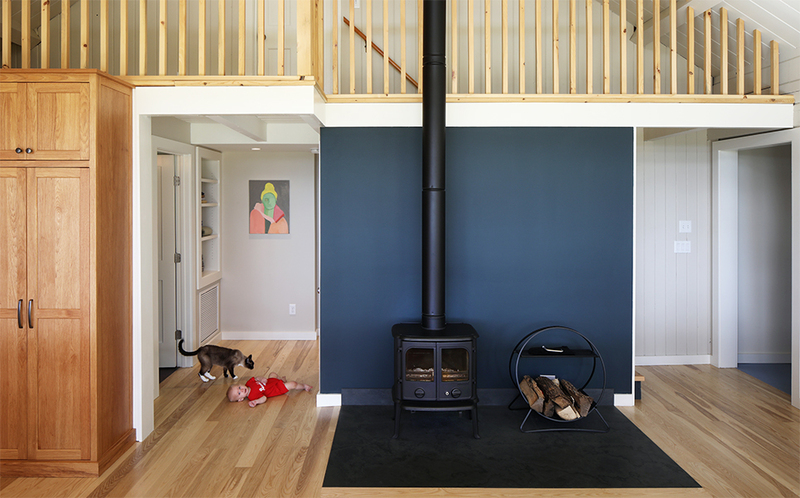 The new hearth and stove provide a landing pad for wet boots and a far more efficient use of the local fuel – wood. The centralized source of heat is circulated by the new mechanical system using low wattage fans. Clad in locally sourced Eastern white cedar shiplap siding, this super-insulated eastern bump will pave the way for Phase 2 renovations. Like many projects, we look for opportunities to phase work, in order allow for the best decisions to be made at the right times. In this case, we focused on basement insulation, new systems, finishes, and improved glazing – all while getting ready for the next project. Nestled within the renovation are electrical and plumbing stubs to the second floor, along with a hidden post, ready to support a second floor bathroom addition. High-performance European tilt-turn windows replaced the drafty old windows. 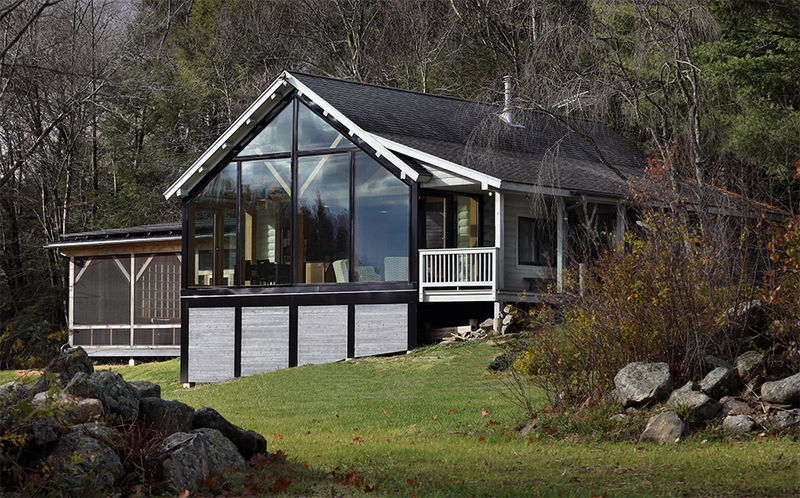 The installation was performed in such a way that exterior insulation and new siding/roofing can tie into the curtain wall, windows and eastern bump, bringing the whole envelope together. 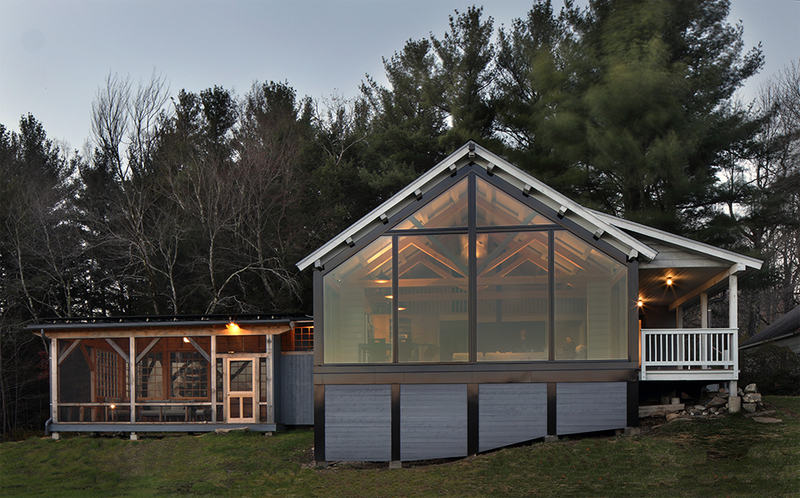 Careful integration of the recently improved and Phase 2 envelope improvements will make this a Net-Zero Capable home. In the meantime, annual energy production from the solar panels will take care of the electrical loads, not including those offset by wood heat. The home is now completely fossil fuel-free. The resulting spaces are truly a pleasure to inhabit. The late fall sun roams across the site telling the story of the day. Each passing cloud alerts the inhabitant to its presence as the daylight rises and falls within. 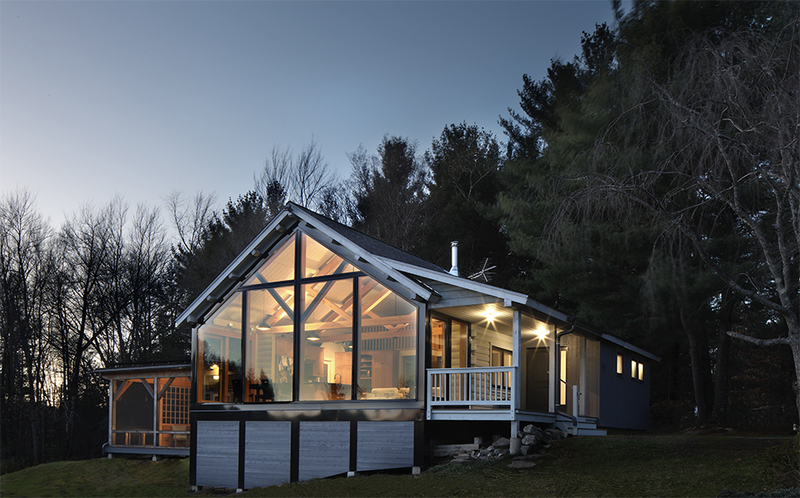 Cozy, warm, and spacious, this log home is no longer a dark, inward cabin. 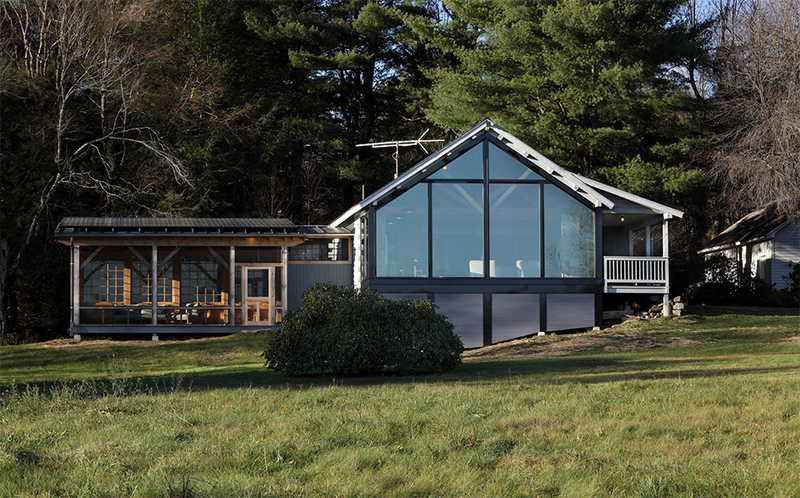 The renovated result is a bright, outward cottage, combining some of the oldest building techniques with cutting edge glazing and mechanical systems to yield a healthful comfortable home. The first “log cabin” in North America came from the Swedish tradition via the Delaware River Valley settlements of the 1630s. From there, the log home became the solid domicile of choice for the western settler. A simple structure of full round logs, scribed & hewn to fit atop one another and notched at the corners to form a simple rugged wall, became an icon of Americana from President Lincoln to Lincoln Logs. Until recently, this was one of the securest and best performing wall systems available. While use of this archaic form declined in the 1800s with the advent of the sawmill, a revival occurred in the 1950s and 60s, with new versions of the log system. By the late1990s, upwards of 60,000 log homes were constructed annually in North America. 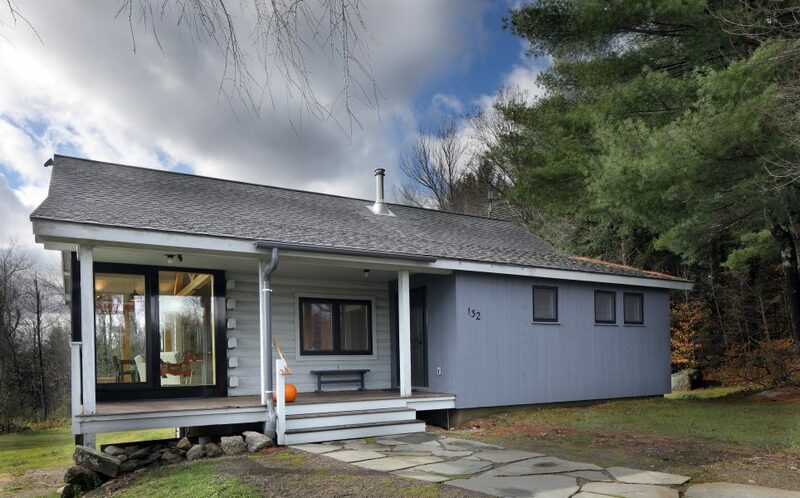 In October of 1974, before the clients were born, and when the architect was only 8 months old, this log cabin was erected on this lovely southern slope in the Berkshire hills. Now highlighted in the Berkshire Edge online.